The best way to run a fundraiser casino to sell tickets. Ticket sales should cover the cost of the hire and also make a starting profit. A representative of your organisation should work at a cash in desk where guests exchange their entry ticket for a set amount of fun money (Usually this is around $200 of fun money). Our tables use a $10 minimum bet so this will enable each guest to have 20 plays on any table without losing. Once your guests run out of fun money they can buy more at the cash in desk. You can set a rate for exchange for example €10 = $50fun money. This allows your organisation to raise additional funds. As with all casinos  the house always wins and you will find that guests will buy additional fun money to keep playing the tables. 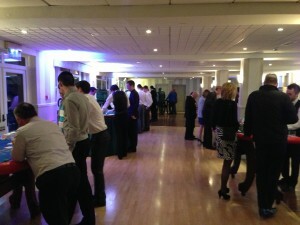 The prizes for the winners can be donated by businesses and members of your organisation. Prizes cannot be cash. Some examples of prizes won on previous nights include; Holidays, Electrical items, Vouchers, Alcohol, Golfing / Sporting items, Hampers, Signed memorabilia and Experience days. The better the prize  The more competitive it gets at the tables! 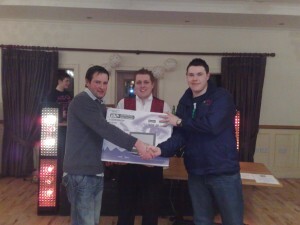 We have had one Casino Night in Dublin where a brand new BMW was the prize! 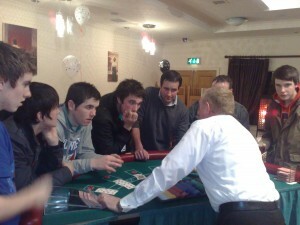 You can approach local business to sponsor a casino table for €50. 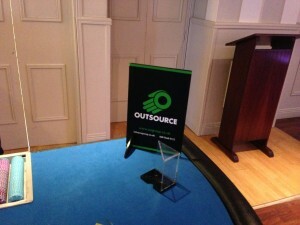 They can put their sign and promotional material on the table and also give out branded merchandise as spot prizes. This is a great way of raising additional funds. The roulette wheel has 37 numbers and guests can buy a number for a set price. Once all numbers are sold, the wheel is spun and the winning number wins a prize. This can be used as a side bet when your guests are at the cash in desk and can also be setup a week before so that guests who are unable to make it on the night still have an opportunity to take part and donate. You can also run a bonus roulette raffle and sell numbers at a premium price with a high value prize for the winner (see case studies). The 5 table package can accommodate up to 100 guests. Each guest receives $200 worth of fun money on arrival; this will give them 20 bets on the casino without losing. When they run out of fun money the guests can buy additional money at a rate of €10 = $100funmoney. The more fun money you sell, the more money you raise! When buying fun money your guests can buy a slot on the bonus roulette wheel raffle. The roulette wheel has 37 numbers (0-36). Guests can buy a number for €5 which means when the wheel is full you will bring in €185. The wheel is spun and the winning number will win a cash prize of €90 and you will raise the €95. This is a great way of raising additional funds as the cash bonus is a great incentive to donate.